The first written mention of this mill and the gulley leading from the Lužnice River (and therefore clear proof of its existence) dates back to 1367 to a deed in which the Rožmberk brothers showed they had sold their neighbour in Třeboň, Merkl, known as Lender, and his heirs their Opatovice courtyard including the mill and pond and the ditch bringing water from the Lužnice to the mill. However, the origins of the Opatovice Mill (and the gulley leading to it from the Lužnice, which later became the basis for the Golden Canal) are older. According to older sources, it is linked to the emergence of the so-called Lanštejn ditches, which later became the basis of the Golden Canal. Later research places its origin around the middle of the 13th century. The origins of the ditch and the mill is directly linked to the effect of Cistercians in Světlá (Zwettl, Austria), whom Vítek of Klokot donated the village of Presnik to. It is assumed this village was located on the site of Opatovic (Opatovice = villagers of Opatovice). The original mill was probably located more to the southwest (approximately near the present day sports compound in the direction towards Vrchy) where Presnik is understood to have been located. Settlement dating to this time has been proven by archaeological finds. Around 1510, Štěpánek Netolický moved the flow of the Golden Canal drains under the dyke of the newly built Opatovice Pond, which also changed the position of the Opatovice Mill to its present location. 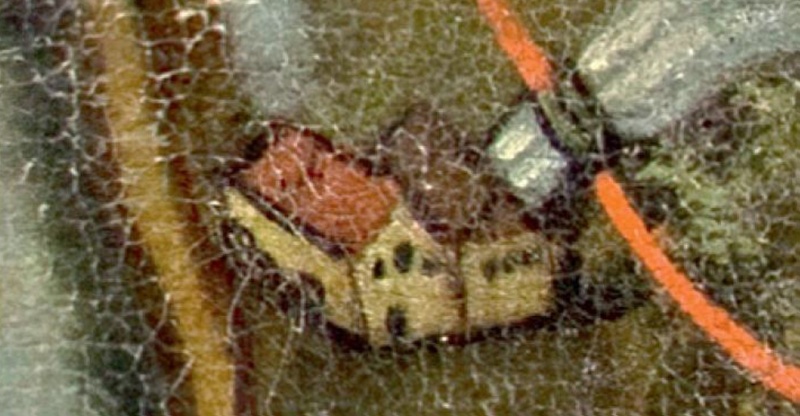 1367 the mill (the courtyard and its parts, meadows and pastures and the Opatovice mill with its pond and gulley as far as the Lužnice River) is sold by the brothers Petr, Jošt, Oldřich and Jan of Rožmberk to the burgher Merkl, know as Lender, and his decedents. 1367 a monastery was established in Třeboň, gaining half of Opatovic prior to 1374 as a gift from the founding Rožmberk family and the monastery bought the rest in 1376. 1439 the mill was outfitted with seven wheels (after it was slightly damaged in the fighting during the Hussite Wars); the mill run was used for floating wood to the town. 1566 the monetary is secularized and passes to ownership by the Rožmberks. At that time it had seven flour wheels and eight oil ones, a draper’s fulling machine and a stamping mill for hulled grain. 1579 Václav Březan notes: “Then the mill in Opatovic with sixteen wheels is almost thoroughly rebuilt from the ground up as the sawmill at the same mill has been rebuilt, in which a large and excellent amount of planks can be cut.” Its sixteen wheels ranked it among the three largest mills in Bohemia. 1590 the mill has 15 flour wheels, 5 stamping mills and 2 sawmills. 1603 Opatovic’s gullies were put to use as a water pipeline for Třeboň. 1607 14 bucket wheels are added, a small stamping mill with 5 stampers, a fulling machine with 2 levels and metal plates. 1625 4 years prior, at the beginning of the Bohemian Revolt, the mill was burned to the ground by Imperial troops, and renewed at great expense with at least a dual composition being established for the time being. 1631 The Třeboň monastary was restored and part of the “restitution” was the return of the Opatovice Mill. The prelate installed a permanent beer taproom in the mill in 1642 (which of course, was the subject of a long-standing dispute with the city up until 1720). 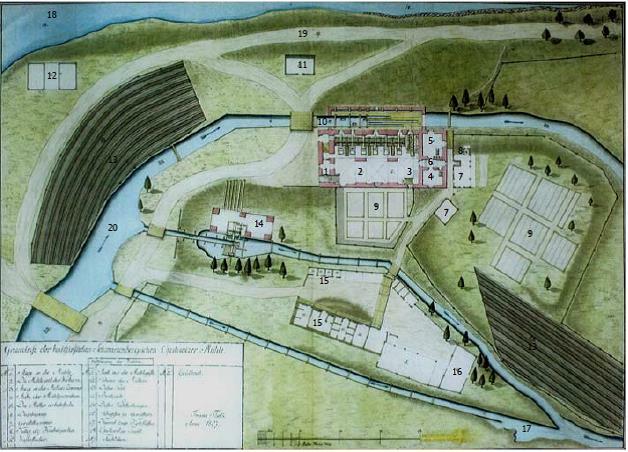 The Opatovice mill on a section of the Map of Třeboň’s Domain from 1684, source: The State Chateau of Třeboň. 1695 – The Třeboň prelate Norbert Hermann had the Opatovice Mill renovated in 1695, as announced by the writing on the facade of the mill, noticeably also in the middle of the 18th century: N. H. P. T. 1695, i.e. Norbert Hermann praepositus Trebonensis 1695. 1708 the mill was rebuilt again by Jan Prechtl, the abbot of the monastery. 1727 the mill burned down, but the abbot, Prechtl, rebuilt it in its current form. (On the façade of the mill is a well-preserved stone cartouche with writing about the rebuilt mill). 6 grinders, 5 stamping mills and one sawmill were built. Room in the mill with arches and columns in their original baroque form (uncovered during reconstruction of the building in the autumn of 2012). Třeboň‘s abbot spent the summer months here, which is why a sacramental chapel was built next to his room on the first floor. F. J. Prokyš painted the alter recess and a picture of St. Ubald on the altar in 1777. Other furnishings from the chapel include: a picture of the Image of the Cross by Lazar Marie de Sanguinetti from 1728, portraits of local abbots, princes from the Schwarzenberg family and armour from the 16th century. Alter and decorations in the recess chapel, source: Břeský family archive. Václav Wolf was the miller here from 1765. The monastery mill was sold to him in 1769 as an emphyteutic lease. 1785 the monastery was closed. Jan Nepomuk of Schwarzenberk purchased the mill. 1788 he sold the mill with six mill water mechanisms, one to produce millet grain with five stampers and one sawmill to an emphyteutic holding by VáclavWolf, a miller, and then his son Václav in 1810. Areal view of Opatovice mill/courtyard (1807), caption: 1 stairs to the mill, 2 the mill with its machines, 3 stairs to the miller’s room, 4 room for the employees of the mill , 5 miller’s work room, 6 hall (passage), 7 tool room, 8 cellar for the kitchen garden, 9 kitchen garden and ornamental garden, 10 mill race, 11 stables for guests of the mill/miller’s customers, 12 miller’s barn, 13 miller’s field, 14 sawmill, 15 miller’s stables/cow shed for cattle, 16 barn for wood for tools, 17 navigation canal, 18 Opatovice pond, 19 fisherman’s dam, 20 Golden Canal, source: State Regional Archives in Třeboň. 1816 Upon Václav’s death, the mill was taken over by his widow Terezie Wolfová. Shortly before her death, she married the head miller Václav Břeský (descending from an old milling family) and willed him the mill. (The Břeský family traces their origins to the former orphanage administrator for the Eggenburk Princes in Český Krumlov, Colonel Jakub Břeský, who was promoted by Duke Johann Kristián of Eggenburk (in honour of his ancestors’ fight against the Turks in Hungary and for his achievements in his managing princely property) to aristocratic status with a nobiliary title of Birkenfels). Františka (née. 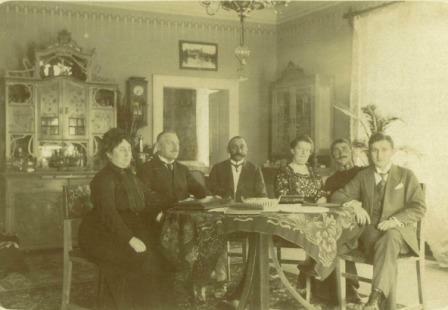 Tuscherová) and Václav Břeský (the second miller) with their children Markéta (married name Martínková) and Vojtěch; photo taken from the period before 1903, source: Břeský family archive. The grounds of the Opatovice Mill (with the sawmill and agricultural buildings) taken approximately from sometime during the First Republic, source: the Přibil postcard collection. Interior of the living quarters of the mill (the picture on the right: the last miller from the Břeský family is the third from the left), source: Břeský family archive. After the deaths of the widows of the last millers in the 1950s, the state “took over” the mill. They were still considering the possibility of establishing a Museum of Living Water here in 1959. The Institute of Microbiology AV Czech Republic was located here in 1962. The agricultural buildings were removed during this reconstruction (the sawmill, barn and stables). During the last reconstruction (2009–2014) the arches and columns were exposed again, the decorations resorted in the chapel recess, and the rafters were revealed in the attic. The Chapel of Jan Nepomuk was restored near the mill and the Guardian Angel statue was returned to the compound after reconstruction. The is not just the story of this 650-year-old mill, but rather the almost 800 years of history of buildings in this area, a story of bringing water from the Lužnice River, the basis for the golden Canal, and thus even the water for the town and its fortification. It is the story of the beginning of the cultural heritage of water constructions (canals, ponds, drainage systems, the total cultivation of the landscape in harmony with nature and the use of water wheels, not only for milling); it refers to the significant role the Opatovice Mill has played not only in Třeboň, but also the role this building has played for the entire cultivation of the surrounding landscape.